Contrary to the demand of the Friends of Lincoln Lakes, the Lincoln planning board has decided not to implement a 120 day moratorium on wind. What's my opinion? Like most rural towns in this state Lincoln is in need of economic stability. The installation of this project would inject tax revenues into Lincoln for years to come. The long term benefits could include various public development projects, the possibility of lower tax rates and a general strengthening of our economic situation. Yes, there are some people that will always feel the turbines are un-sightly and that they disturb the natural surroundings. And yes, this project would also be more enticing if it was a Maine based company that would benefit from it's installation. And yes, the project would be even MORE enticing if it meant our electricity rates would come down. There are always going to be ways in which these projects could be "better." The fact is that due to de-regulation, First Wind will have the ability to sell this electricity wherever they see fit, presumably where they can get the most money for it. De-regulation installed a market based economy for electricity and just as we've seen recently in the financial markets, they don't always work. In fact the removing of regulation often has the opposite affect as businesses work to maximize profit. Case in point look at the upward trend in electricity prices over the past decade. Honestly though this is not First Wind's fault. They are just a player in the electricity generation market, they do not make the law. And, their proposed investment in our town should be seen as a net positive. What this project does do is put Lincoln in a strong position as we move into this next cycle of economic downturn and the eventual restraints on our state's power grid. Imagine years from now if regulation of power generation takes place. 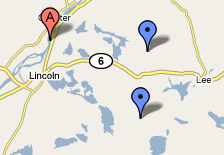 The town of Lincoln may have the opportunity to purchase power from First Wind, transmit it using Bangor Hydro's transmission lines and sell it directly to you, the Lincoln resident. This may be many years down the line but installing these turbines here in Lincoln is a long term investment, one that will pay dividends for years to come and eventually may even equal a windfall for the town.